This Nativity scene is sculpted from pewter in Guadalajara, Mexico. The metal is polished to a high shine. The scene depicts the Holy Family in a stable with a very large star overhead. The three wise men with gifts have come to worship Jesus. The kings’ animals are a camel, elephant, and horse or mule. 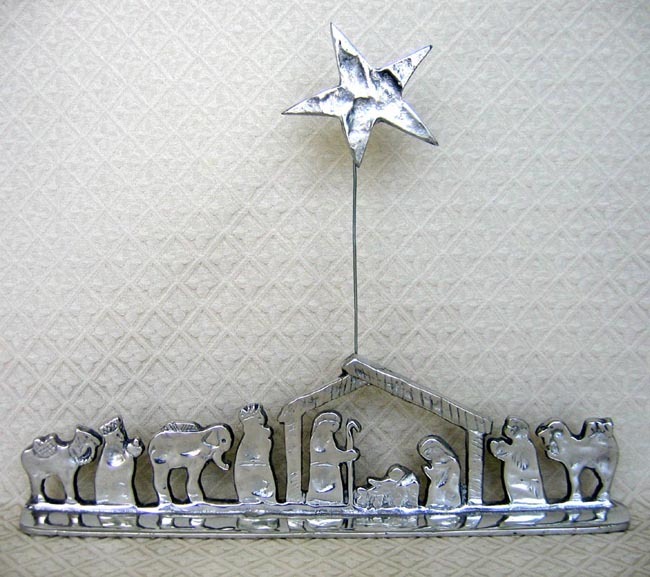 The scene measures 15 inches long and 12 inches tall with the star. In 1958, Mr. Angel Alvarez Gonzalez began a bronze and iron foundry for melting aluminum gate valves. In 1995, he expanded into items made from pewter. Now his business makes hundreds of gift items from pewter, but only a few Nativities. Usually 5 to 6 family members work with him, but seasonal demands can require that more family help him.